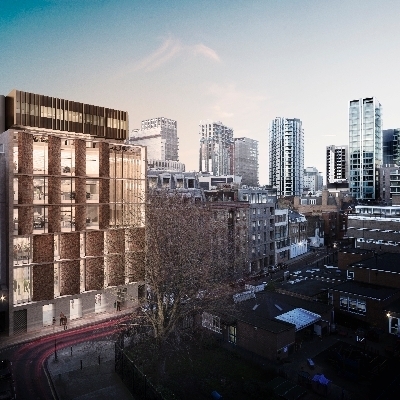 After several months of waiting, planning permission for redevelopment of the Good man Building was granted after only a few minutes’ discussion by Tower Hamlets Council in February. It is now full steam ahead with the next phase, which is demolition of the building. The work has already gone out to tender and a contractor appointed. It will take 2-3 months before demolition work starts. In the meantime the contractors will assemble their equipment and prepare the site. Once the site has been cleared work on our new premises will begin, probably towards the end of this year. The building programme should take just over a year, giving a completion date of spring 2018. Architect's impression from the south of the Alie Street development. The architects, Bennetts Associates, have created a computer-generated image of what the building will look like from the back, showing the members’ room on the ground floor and lecture theatre on the first floor with meeting rooms and offices above. The open three-storey atrium, which will bring light into the heart of the building, is clearly seen. The pavilion on the top, set back from the rest of the building, will provide flexible meeting space with fantastic views of London from the two roof terraces. I will report back when demolition work begins.